Keypad locks are the logical evolution of the locksets used in most doors, from houses to buildings. In secure installations, they are in practically every door. Properly installed, these devices provide better security than the traditional locksets that have been fitted to doors for centuries. With the increased public knowledge of the design of tumblers and keys, once-secure devices are now more easily picked. These have enabled thieves to gain access to edifices and structures once deemed secure. The advent of keypad locks have enabled owners of houses and buildings to keep pace with the increased security needs of today. Keypad locks, also known as keyless locks, come in 2 basic forms. One is a unit which has analog buttons on it, which you press in combination to unlock a door. The other variation uses a touchpad, which anyone with a smartphone is familiar with. Variants to these basic designs may include multiple inputs like fingerprint recognition (also known as biometric identification), wireless actuation, or an RFID key. All keypad locks are user programmable, allowing one to change codes when the owner sees fit. A fairly common feature is giving guests a temporary code which can expire after a set time. All these keypad locks use a power source, usually a set of batteries contained within the unit. Some use 4 AA batteries while others use a 9-volt cell. Typical life should be about a year before needing replacement. Users who have used keypad locks on low traffic doors have reported battery service life of two years or more. The better units have an indicator for low battery charge so that you don’t get caught fumbling for a key, or needing to call a professional because the lock has become inoperable due to a dead battery. A lot of models include the familiar key slot for use in an emergency (such as when the electronics fail, or when the battery runs down). There are two major reasons for using keypad locks – security and convenience. With a keypad lock, one only has to distribute the access code to those who need to know, be it family members or department personnel. No need to have individual keys cut for each and every person who needs access to a particular door. When leaving your house, you will also have the peace of mind that the keypad lock will automatically lock your door. No more worry at the back of your mind if you had locked the door to your abode. Once inside your house, the automation of a keypad lock will also assure you that your key has not been left hanging outside your door. For kids (and older people), this is a boon for security as it ensures that they will be not be victims of random or opportunistic crimes when the key is inadvertently left outside. In the case of commercial or industrial establishments, keypad locks offer the same convenience, in addition to an easy way to control access. With more sophisticated models, one can schedule times when a particular code is accepted or not. The function to accept multiple codes means that high level executives can be allowed access anytime, while clerical staff will be allowed access only during business hours. In addition, access logs can be kept, allowing an administrator to check when a particular unit was activated. This will be an indicator of unusual access times, or attempts by a particular code combination to access the lock during unauthorized times. 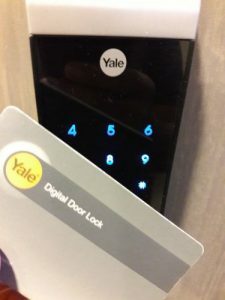 This Yale digital door lock can operate with both a pin and car reader. Keypad locks have numerous advantages in aesthetics, convenience, and security. But all these advantages come with some negatives. Primary among these is the price of a keypad lock. Entry-level units can range from $100-$200. 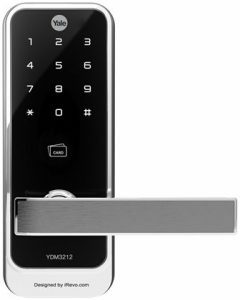 Multifactor units (keypads with biometric readers or additional security modes) can run upwards of $3,000. With wireless-enabled units, issues have been reported where batteries were drained in a matter of a few months, if not weeks. These were caused either by poor design, or by users who were not able to optimize power management and standby settings. Others factors affecting battery life include activation frequency (once a day vs. 20 times a day), sensor sensitivity (which could keep on activating if overly sensitive), and battery quality. Biometric sensors and RFID augmented keypad locks can also function erratically. A dirty or wet finger can cause a fingerprint sensor to behave erratically, while an RFID keycard can not function properly if there is a strong radio transmitter nearby. Then, there is the human factor. Some my have issue keeping a passcode in memory. Either there will be a temptation to write it down where it’s easily accessible (such as a notebook or phone), or the the code is simply forgotten. 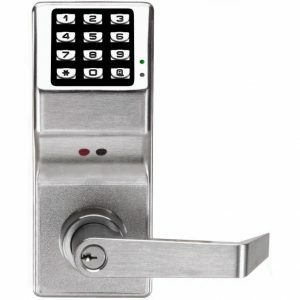 Proponents of keypad locks maintain that these modern units are more reliable than traditional pin and tumbler locks because of the lack of mechanical wear and tear. That is true, but one must bear in mind that electronics have their own set of problems, such as batteries running down, corrosion in the contacts, or corrupted firmware. That being said, continuous improvement in the design and manufacture of electronic components means that current and future models will work quite reliably when used with the manufacturer’s recommendations in mind. Installation of a keypad lock can be accomplished with basic tools and rudimentary DIY knowledge. Most keypad lock models have variations that take into account the various ways locks are attached to door, be they mortise, rim, or cross-bore fittings. Because of this, most keypad locks on the market can replace traditional mechanical locks with little modification to the existing door. If you are doing the installation yourself, make sure that you are comfortable with the programming instructions, as physically installing the lock is just half the job. Also remember to keep the manual in an accessible place as you will surely be consulting this from time to time. To speak with one of our team regarding your specific keypad lock requirements in the Denver Metro area, please fill out the contact form below, and we will be in touch with you shortly.